The Ten Tigers of Canton or Ten Tigers of Guangdong refers to a group of ten Chinese martial artists from Guangdong Province who lived around the 19th century during the Qing dynasty in China. They were said to be the best fighters in southern China at the time. Much of their existence has been embellished by folk legends and stories passed down from generation to generation. The Ten Tigers of Canton traced their martial arts lineage to the Southern Shaolin Monastery in the Jiulian Mountains in Fujian Province. 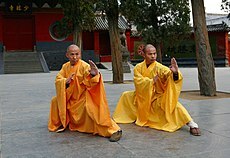 Southern Shaolin is a branch of the better known Shaolin Monastery on Mount Song in Henan Province. As such, the Ten Tigers' martial arts styles resemble those of Shaolin Kung Fu. Wong Yan-lam or Wang Yinlin (王隐林; 王隱林; Wáng Yǐnlín; Wong4 Jan2-lam4), also romanised as Wong Yein-lam, was a student of the Tibetan monk Xinglong (星龍), a master of the "Lion's Roar" (獅子吼) style of martial arts. Wong mastered this style, which later split into the Hop (Hero/Knight) Family Fist (俠家拳), Lama Style (喇嘛派), and White Crane Fist (Tibetan White Crane 白鶴拳). Wong Ching-ho or Huang Chengke (黄澄可; 黃澄可; Huáng Chéngkě; Wong4 Cing4-ho2), also romanised as Wong Cheng-ho, was a student of Luk Ah-choi (陸阿采; Lu A'cai). He specialised in the Nine Dragons Fist (九龍拳). So Hak-fu or Su Heihu (苏黑虎; 蘇黑虎; Sū Hēihǔ; Sou1 Hak1-fu2), also romanised as Sou Hark-fu, was a student of the Shaolin monk Zhaode. He was trained in the Southern Shaolin Style (南少林) but later created his own style, which is known as Black Tiger Style (黑虎門). Wong Kei-ying or Huang Qiying (黄麒英; 黃麒英; Huáng Qíyīng; Wong4 Kei4-jing1), also romanised as Wong Khei-yin, was a student of Luk Ah-choi (陸阿采; Lu A'cai). He is best known for his skill in Hung Ga (洪家). He also was the father of Wong Fei-hung, who wasn't one of the Ten Tigers but is sometimes referred to as the Tiger after the Ten Tigers. Lai Yan-chiu or Li Renchao (黎仁超; Lí Rénchāo; Lai4 Jan4-ciu1) was a practitioner of the Hakka Fist (客家拳), which was also known as Southern Praying Mantis (南螳螂). He was also known for his skill in the Seven Stars Fist (七星拳). So Chan or Su Can (苏灿; 蘇燦; Sū Càn; Sou1 Can3) was a Hung Ga (洪家) practitioner. He was famous for his skill in Drunken Fist (醉拳) and Shaolin Staff (少林棍). He is more commonly known by his nickname "So Hut-yee" or "Su Qi'er" (苏乞儿; 蘇乞兒; Sū Qǐ'er; Sou1 Hat1-ji4), which means "Beggar So". Like Wong Fei-hung, he is also regarded as a folk hero in Chinese popular culture and has been the subject of films such as King of Beggars (1992) and True Legend (2010). He also appeared as a supporting character in some movies about Wong Fei-hung, most notably Drunken Master (1978). Leung Kwan or Liang Kun (梁坤; Liáng Kūn; Loeng4 Kwan1) was primarily trained in Hung Ga (洪家) but was also known for his skill in the Iron Wire Fist (鐵線拳). He is more commonly known by his nickname "Iron Bridge Three" (铁桥三; 鐵橋三; Tiě Qiáo Sān; Tit3 Kiu4 Saam1). Chan Cheung-tai or Chen Changtai (陈长泰; 陳長泰; Chén Chángtài; Can4 Coeng4-taai3) specialised in the martial art Iron Finger (鐵指). He was nicknamed "Iron Finger Chan" (铁指陈; 鐵指陳; Tiě Zhǐ Chén; Tit3 Zi2 Can2). Tam Chai-kwan or Tan Jijun (谭济筠; 譚濟筠; Tán Jìjūn; Taam4 Zai3-gwan1) was a practitioner of the Huadu style of Hung Ga (洪家) and Tam Ga (譚家). He was nicknamed "Three Legs Tam" (三脚谭; 三腳譚; Sān Jiǎo Tán; Saam1 Goek3 Taam4) for the three types of kicks he used. Chau Tai or Zhou Tai (周泰; Zhōu Tài; Zau1 Taai3), also romanised as Jau Taai and Chow Thye, was known for his "soft-hand" techniques and his mastery of the long staff. He created the martial art Zhou Family Bagua Staff (周家八卦棍), who has been passed down for generations in his family. He was also a master of Choy Li Fut (蔡李佛), which he integrated into his other martial arts styles. His descendants, Hung Chau (great grandson) and Michael Chau (great-great grandson), reside in San Francisco, California, United States. The Ten Tigers first appeared in the 1978 film Ten Tigers of Shaolin (廣東十虎) produced by Mei Lam Film Production Company. The Ten Tigers appeared in the 1979 Hong Kong film Ten Tigers from Kwangtung (廣東十虎與後五虎) produced by the Shaw Brothers Studio. It featured a star-studded cast of Shaw Studio actors, including the Venom Mob, Ti Lung and Alexander Fu. A fictionalized version of the Ten Tigers were featured in the 2004 film Around the World in 80 Days, with Sammo Hung making a special appearance as Wong Fei-hung. Wong and the Ten Tigers assisted the protagonists in liberating the village of Lanzhou. In 1999, Hong Kong's ATV produced a 40-episodes TV drama series titled Ten Tigers of Guangdong (英雄之廣東十虎). In The Eleventh Tiger, a BBC Books original novel by David A. McIntee, the Ten Tigers are featured, with Wong Kei-ying and Wong Fei-hung as major characters in the story. The electronic music artist Bonobo has a track called "Ten Tigers" on his 2013 album The North Borders. ^ Kim, Sun-Jin. Tuttle Dictionary of the Martial Arts of Korea, China & Japan. (1996). Tuttle publishing. Korea. ISBN 0-8048-2016-3. ^ a b c d e f g h i j 王春芙, 王春英, 陳朝華, Southern Metropolitan daily Guangzhou publications (南方都市報廣州專刊副). Guangdong's past & present. (廣東的前世今生). Using for name verifications. Originally in simplified characters. Published by 花城出版社. Digitized Aug 7, 2007 University of Michigan.